Telomerase, which ensures the unlimited proliferation by adding TTAGGG repeat at the end of the chromosome, is strongly activated at a very high incidence in a variety of malignant neoplasms including pancreatic cancer. In addition to the acquisition of the immortality, telomerase plays an important role in the aggressive behavior of pancreatic cancer. Invasiveness of human pancreatic cancer cells correlates well with telomerase activity. Exposure of pancreatic cancer to anticancer drugs up-regulates telomerase activity, and the increase in telomerase activity correlates with resistance to the drug-induced apoptosis. 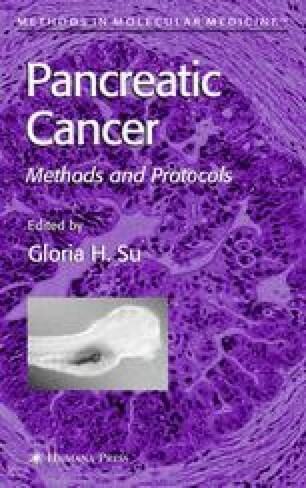 More important, diagnositic values of telomerase activity are highly focused because of the lack of other specific genetic markers for pancreatic cancer. Samples of pancreatic juice are obtained at endoscopic retrograde pancreatography using a balloon catheter after intraveneous injection of secretin. Because the pancreatic juice has strong protease and RNase activity, addition of protease inhibitors and RNase inhibitors in the telomerase extraction buffer is necessary for the detection of telomerase activity in the pancreatic juice. A telomeric ladder was detected in 80% patients with carcinoma, whereas only 4.3% patients with adenoma and none with chronic pancreatitis showed positive telomerase activity.